We’ve all heard the famous saying “Necessity is the mother of invention.” Those of us involved in the insurance business in America need not look far for proof that this time-honored doctrine is true. While the first mutual fire insurance company was founded in London in 1696, it was not until Benjamin Franklin and several associates founded the Union Fire Company, a firefighting organization, that the idea began to develop in the U.S. It was the success of these firefighting groups which spawned the interest in developing mutual associations for the purpose of providing fire insurance to property owners. In 1750, Franklin used his Union Fire Company meeting to propose a fund from which losses to members of the company could be paid. The members initially raised $1000. Within two years, Franklin expanded the idea to citizens of Philadelphia and formed The Philadelphia Contributionship for the Insurance of Houses From Loss by Fire. The basic tenets set forth by Franklin’s company (inspection of every home to determine construction, occupancy and character of the risk, as well as continual building of policyholder surplus as a safety cushion for insureds) have laid the groundwork for some of the finest mutuals still in existence. Like the evolution of most great ideas in this country, mutual insurance began to take on great importance. With its growing popularity came the "need" for more efficient and service-oriented companies. 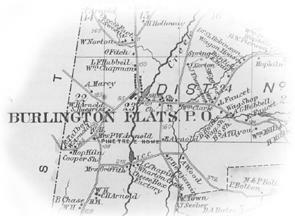 Burlington Flats was named after the Burlington Company of New Jersey, which obtained the land title in 1786. The first settlers arrived in 1790. This need was clearly evident 100 years ago in Burlington Flats, New York, when a local pioneer and entrepreneur named Silas L. Kelsey suffered a terrible fire loss to his barn. Unsatisfied with the loss adjustment he received from his insurer at the time, Kelsey urged his friend Edgar W. Wright to join him in founding an insurance company at would offer fair rates and claim settlements to the client, while maintaining a strong balance sheet for long-term policyholder security. 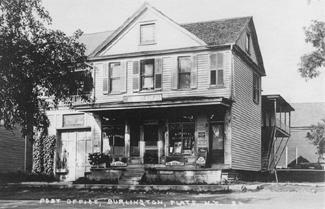 Early photos of downtown Burlington Flats around 1920-22. The company’s first meeting was held at the hotel of D.A. Dyer on February 18, 1897. The company’s bylaws and charter were adopted. By the spring of 1897, a plan emerged. The office was to be housed in a back room of Kelsey’s home. Wright was named president of the company, while Kelsey assumed the role of secretary and manager, allowing him to personally secure and service all the company’s policyholders. 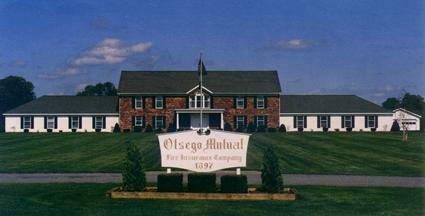 During the latter half of the 19th century, this scenario played out across America as a period of great expansion in rural wealth gave birth to hundreds of "farm mutuals," many of which are still in business today, but few have attained the success of Otsego Mutual Fire Insurance Company. 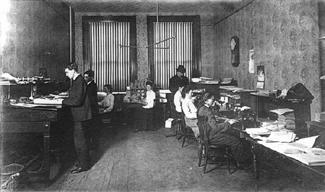 The first location of Otsego Mutual Fire Insurance Company in 1897 was in the back. This group photo of (from left) Edgar W. Wright, Silas L. Kelsey and Bina Brady was taken in 1909 in the back room office of Kelsey’s house. When the company’s first year came to a close, it had 553 policies in force, generating $4,162.40 in premiums. As only four losses were paid, totaling $1,055.95, and expenses were $1,684.30, the policyholder surplus account was a very respectable $2,478.10. he and Kelsey reversed roles, having reached over $5 million in coverage in force, from the just over $500,000 developed in their first year in business. Then, with more than 30 agents, Kelsey was able to concentrate on meeting the changing needs of his clients and ensuring the company’s future success. 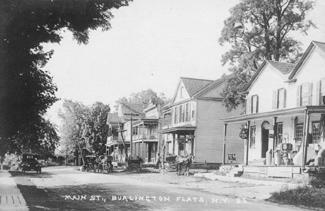 Even though the company became recognized beyond New York State’s borders, its roots remained firmly in Burlington Flats, New York. The company’s leadership throughout succeeding years remained as solid as it was under Edgar Wright and Silas Kelsey, as did the ties that bound the company to the village of Burlington Flats. By 1927, led by Jasper D. Fitch, president; Edgar Wright, secretary' and Silas Kelsey's daughter Mary Kelsey Hume, treasurer, the company built a new headquarters to mark its 30th anniversary. 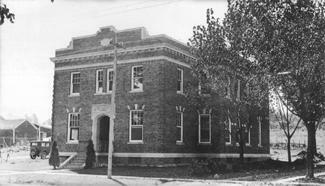 The two-story brick-faced building was the pride of the town. No sooner was the building complete when hard times hit the United States and Burlington Flats. As the economy tightened, people were not able to buy as much insurance and even though the insurance in force approached $20 million, the growth of the company was moderating. By 1927, it was evident that more space would be needed. A new building was built to celebrate the 30th anniversary. 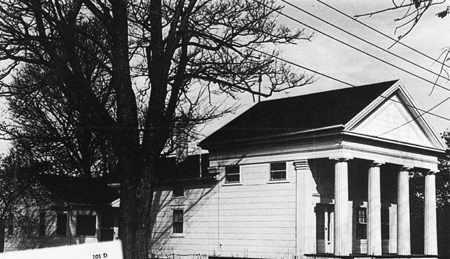 This Greek Revival homestead in West Burlington is one of the oldest properties still insured by Otsego Mutual. Its owner, Virgil Zinninger, remembers back to an even earlier time when company founders visited the farm on which his great-grandparents carried a policy before settling here with his parents. One of Burke’s initial changes involved the revamping of Otsego’s marketing territory to include only New York State. The company had done business in other states, but felt it had been obtaining adverse selection. When Burke assumed the leadership role, Otsego’s premium writings were $1.7 million, assets were $3.7 million and policyholder surplus totaled $2.34 million. While the company was in an admirable financial position (and already had attained its coveted A+ rating from A.M. Best Co.) at the onset of his career with the company, Burke quickly developed a reputation for using common sense and excellent instincts to refute industry trends toward uncontrolled growth. His original goal when joining Otsego Mutual was “to make the policyholder surplus grow faster than the premium writings,” a goal most companies could never aspire to, much less accomplish. To the surprise and envy of many colleagues, this goal was achieved and continues to proliferate. In March 1977, Hinds retired and Burke was elected president. At the same time, Albert W. Akulonis, who had been an executive at Preferred Mutual, joined Otsego as secretary and production supervisor. Akulonis had worked extensively in the Downstate New York region and parlayed his strengths there to embed Otsego’s products into an impressive agency force, many of whose members continue to represent the company. Marked by impressive growth and the continued achievement of growing policyholder surplus faster than premium writings, Burke’s tenure left perhaps a bigger legacy–his focus on improving the lives and working conditions of Otsego’s employees. During this time, a comprehensive benefit plan, including pension, savings plan, health insurance and reduced and flexible workweek took effect, as well as construction of a new, more ergonomic home office in Burlington Flats. His devotion to family values was admired and appreciated by employees, as evidenced by Otsego’s staff averaging 18 years of experience with the company. Beyond his offices in Burlington Flats, Burke also worked diligently to serve others. In nearby Edmeston where he lived, he was a member of the Edmeston Rotary, Recreation Association and Farmers Lodge, president of its library board, and treasurer of its fire department for many years. He also served as a board member of the Central New York Association of the Blind. His tireless efforts proved vital in the industry, too. Once active in the Air Force Reserves’ Fire and Rescue Division, Burke later became highly involved in arson investigation and was instrumental in the formation of one of the first Arson Task Forces in the state during Governor Hugh Carey’s administration. In the 1970s, the company posted underwriting profits in eight of the decade’s 10 years. In 1976, with direct premium writings of $2.4 million, assets of $4.6 million and nearly $3 million in surplus, the company began what has turned into an impressive string of 21 consecutive years with an underwriting profit. As a result, Otsego Mutual continued to prosper, showing steady growth in surplus and income. The decade of the 1980s saw the company continue to hone its niche in providing the fast and courteous service in personal lines coverage. Except for a brief stint insuring homes in Florida, Otsego concentrated on writing both replacement cost and actual cash value Homeowners, Dwelling Fire and Renter’s insurance coverage throughout New York State. This plan was highly successful in the 1980s as written premiums expanded from $4.8 million to $9.1 million, assets grew from $6.7 million to $22.4 million, and policyholder surplus increased 440 percent from $4.1 million to $18.2 million! With Burke’s goal being accomplished and company management eyeing retirement, finding the next era of managers became a priority. Burke did not have to look far, as his oldest child, Kelley, had been with Otsego since 1979 and had worked in various positions including data processing manager and liability claims manager. A 1984 graduate of Utica College of Syracuse University, she was elected vice president in 1988. Later that year, she earned her Chartered Property and Casualty Underwriter (CPCU) designation, and went on to receive her M.B.A. from Syracuse University in 1996. In 1991, Akulonis retired. His replacement, Terry M. Gras, had joined the company in 1988 as a field representative and underwriter. Gras, also a graduate of Utica College, received an M.S. degree in management science from Binghamton University in 1990 and the CPCU designation in 1995. On January 14, 1996, just one year before Otsego Mutual reached its centennial, fate intervened and Patrick Burke died at the age of 59. In very special ways, professional peers remember this man of great intellect and humor "as one of the most outstanding and unique men of our business," and a "success at life, both on the home and business fronts." At the time of Burke's passing, Otsego's policy holder surplus stood at $28.3 million, while premium writings stood at $10.5 million. Not only had Burke achieved his goal, but he grew surplus twice as fast as the writings!